Fresh Renderings Revealed for Transit-Centric, 120-Unit Complex on Long Beach Blvd. Renderings courtesy of Plus Development Group. Thank the architectural gods, Long Beach. After revealing dismal (if not outright hideous) renderings of a project set to take over 1105 Long Beach Blvd., fresh renderings of the transit-oriented housing development have been released. 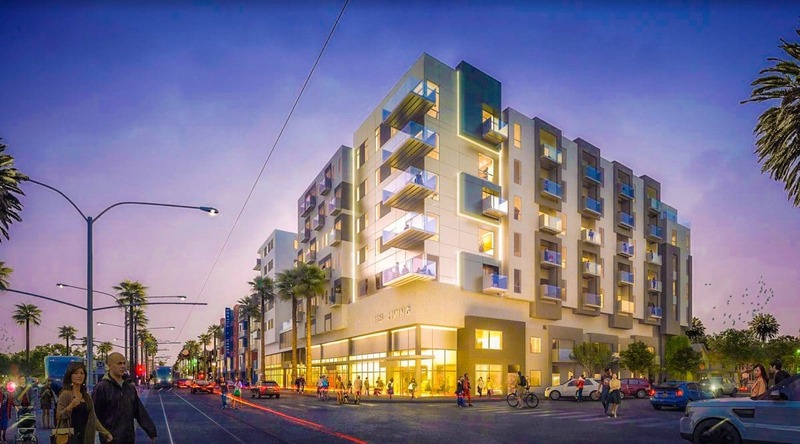 Designed by Architects Orange and developed by one of the groups behind The Current in DTLB, Rockefeller Partners, the development proposes a seven-story structure set to house 120 units along the west side of Long Beach Blvd. just south of 12 St. Reminder: this is just a proposal that has yet to be entitled by facing the Planning Commission let alone approved by City Council. But: any housing is good housing in this climate. Set to take demolish a two-story structure along with a handful of one-story structures, the new complex at 1105 Long Beach Blvd. will occupy roughly 108,343 sq. ft. with commercial ground floor space on the first two floors. While the new renderings reveal a much more ambitious project, it still joins the countless other developments that lack both boldness and interest—along with affordability. While it remains unclear if any of the units will be affordable nor how much or how little they will cater to parking considering the Blue Line nearby, according to Rockefeller, the “architectural façade is purposeful in its treatment” (?) of the “three different types of unit designs” that include studios as well as one- and two-bedroom units.